← Puff Flies and Queen Ella’s Feet. Posted on June 15, 2012	by Katy K.
As with so many knitting books, I heard about this one on the Knitpicks podcast. There I learned that “Joan of Dark” is Toni Carr’s roller derby name, and that she also has a book of roller derby patterns. Knits for Nerds is a fun little pattern book. It’s organized by obsession rather than by garment type – fantasy, science fiction, comics and manga, and general geekiness. The patterns are mostly intermediate and beginner level, while even the advanced projects seemed more on the intermediate side to me. The yarn called for also is universally less expensive yarn, either from Knitpicks or brands available at craft chains – good for both beginning knitters and for people who might not want to make a major yarn investment for something that would be more for costume than regular wear. That being said, there are both flaming and more subtle geek things here, and while the projects are mostly garments, there are also some bags and stuffies, including a tribble and a robot. Declaration of Geek projects include the Princess Leia hat featured on the cover (with three braid variations), the Next Gen sweater, hobbit feet slippers, and a tiny felted top hat called the Top This fascinator, which one of my knitting friends said her teen daughter would go nuts for. Projects that could blend in or not depending on yarn choice, or would be considered medium geek level include a Jayne Cobb scarf and sock set (hat patterns readily available free on Ravelry), a chess board laptop bag, Gryffindor ebook reader bag, and Mr. Nancy fedora and gloves. Those last would stand out a lot in the called-for bright green and yellow, but a) only a really dedicated fan would recognize them and b) there the yarn color really is everything. My favorite projects fall in the Secret Fan category, including the Dragonrider [fingerless] Gloves, Summer Queen Shawl, and the really gorgeous Aim to Misbehave Brown Jacket. This last is a trench coat length sweater, lace from about the waist down, knit in sport-weight yarn. I don’t think I’ll ever have enough time on my hands to knit such a thing, and brown is not really my color, but still… I can dream. The photography is outstanding, models posed with fun and appropriate backgrounds while still showing good detail of the actual project. I had some quibbles with her book-related trivia, but that really is a minor complaint in a knitting book. And while I’m not casting on for anything from this book right this minute, this was very fun to look through myself and with friends, leaving us feeling satisfied and happy with our geekiness. 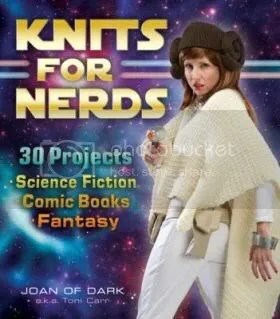 This entry was posted in Books, Uncategorized and tagged geekiness, knitting. Bookmark the permalink.